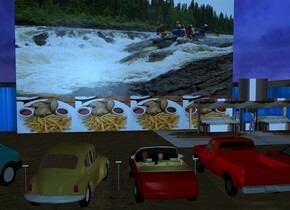 1st 50 feet wide and 30 feet tall [war] wall is above a 50 feet wide and 8 feet tall 2nd [french fries] wall. 1st 7 feet tall car is 35 feet in front of and -8 feet left of the 2nd wall. it faces the wall. a 12 feet tall [hamburger] fruit stand is -12 feet in front of and -20 feet right of the 2nd wall. 3rd 110 feet long and 10 feet tall [metal] wall is 3 feet behind the 2nd wall. 2nd car is .5 feet right of the 1st car. it faces the 2nd wall. 3rd car is 1 feet right of the 2nd car. it faces the 2nd wall. a pickup is 2.5 feet right of the 3rd car. it faces back. 4th car is 3.5 feet right of the pickup. it faces back. 1st 3 feet tall street sign is .12 feet right of the 1st car. 2nd 3 feet tall street sign is -.1 feet right of the 2nd car. 3rd 3 feet tall street sign is .3 feet right of the 3rd car. 1st head is -1.7 feet left of and -.8 feet above and -11 feet to the back of the 3rd car. it faces back. 2nd head is 1 feet right of the 1st head. it faces back. the hair of the 2nd head is camel . 2 dim gentle blue lights are 2 inches behind and -1 inch above the 2nd head. a man is -21 feet in front of and -21 feet left of the fruit stand. he is -1 feet above the ground. a dim igloo blue light is 1 inch above the man. a woman is 5 feet in front of the man. she faces left. the sun is sea blue. the camera light is pond blue. the sun's altitude is 10 degrees.